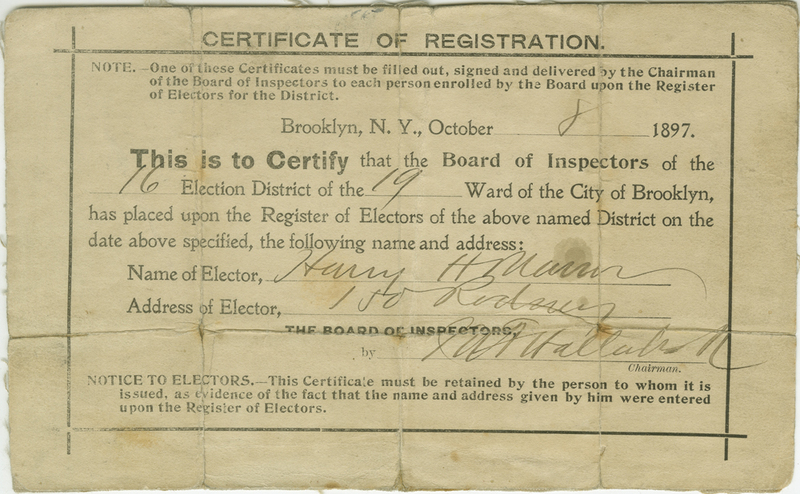 Certificate of Registration, 1897, in the Politics and Government Collection. Museum of the City of New York. 38.176. In honor of the 57th inauguration of the President of the United States, I decided to take a look at how campaigning for political office and the democratic process is represented in the collections of the Museum of the City of New York. 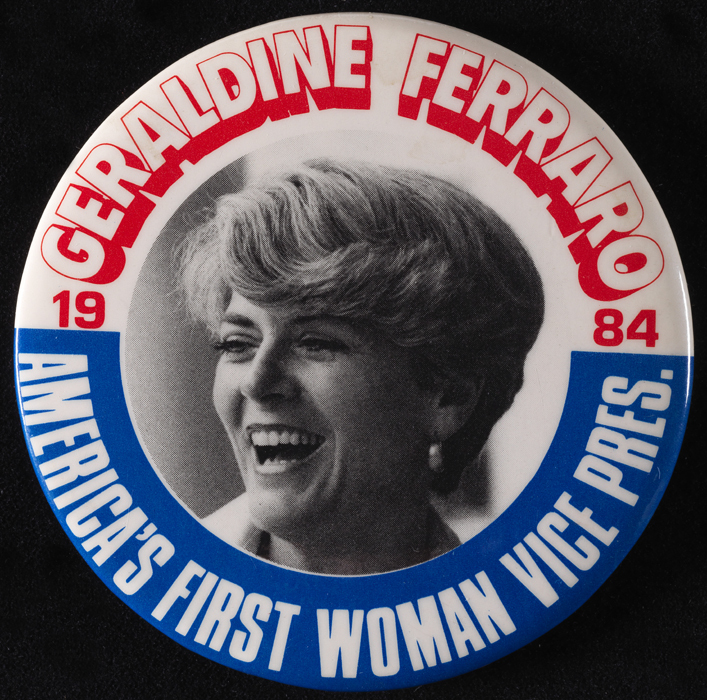 Geraldine Ferraro, America’s First Woman Vice President, 1984, in the Political and Civic Button Collection. Museum of the City of New York. 96.24. Those of you who frequent our online Collections Portal may have noticed the recent addition of hundreds of political and civic buttons and badges to our online content. This collection is representative of the wide array of politicians, offices, and agendas encountered in New York City politics. The collection includes political campaign buttons for female candidates running for local positions, such as Bella Abzug, as well as material associated with New Yorkers such as Geraldine Ferraro and Hilary Clinton who held local political positions, and went on to run (though unsuccessfully, in these instances) for political office at the national level. Candidates have approached the electorate with any number of slogans and agendas, ranging from improved waterways to a clean government. For Congress, Edw. 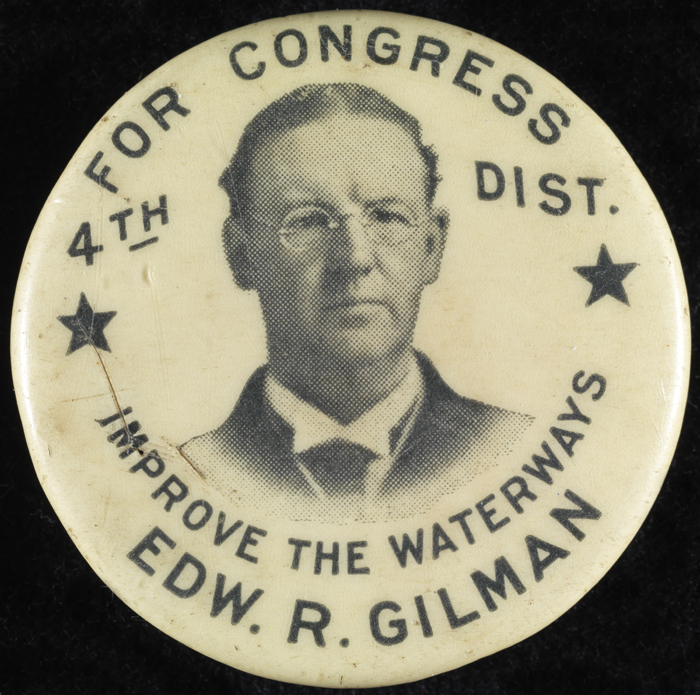 R. Gilman, ca.1905, in the Political and Civic Button Collection. Museum of the City of New York. 96.184.204. 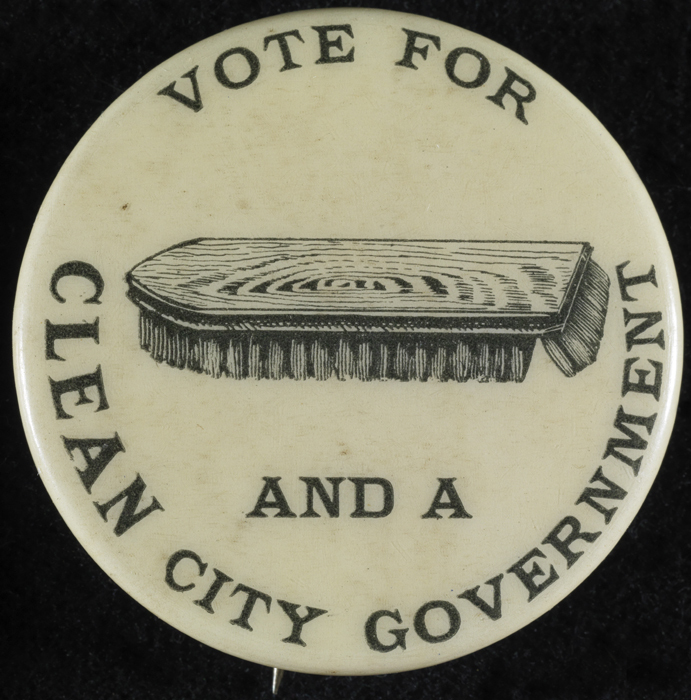 Vote for Brush and a Clean City Government, ca.1895, in the Political and Civic Buttons Collection. Museum of the City of New York. 96.184.193. The collection holds buttons related to mayoral campaigns, including those of Seth Low, John Purroy Mitchel, and David Dinkins; and gubernatorial campaigns, including candidates Nelson A. Rockefeller and Theodore Roosevelt. 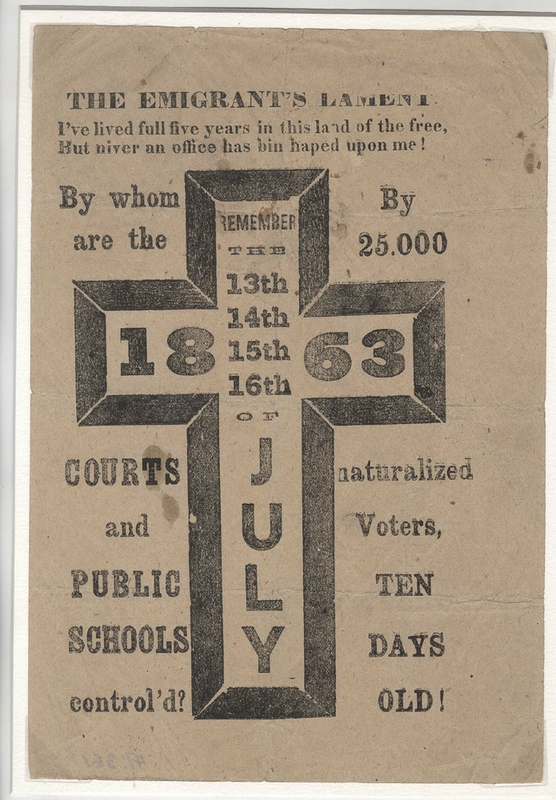 New York’s diverse population is also represented in the political process, dating back to complaints related to inconsistent granting of the right to vote to immigrants, as depicted by the broadside to the left from our two-dimensional paper ephemera Politics and Government Collection; to a Spanish language campaign button for Rudy Giuliani. Grand Sachem – John R. Voorhis – Society of Tammany or Columbian Order, 1917, in the Political and Civic Buttons and Badges Collection. Museum of the City of New York. 52.314.23. One political organization well known for its alignment with the immigrant vote and its influence over New York City politics through much of the 19th century is the Tammany Society or Colombian Order, commonly referred to as “Tammany Hall.” The Museum holds a wide array of objects in the collection associated with the Tammany Hall political machine, including ribbon badges such as the one pictured to the right, over 250 original sketches for political cartoons by Rollin Kirby, excerpts from Harper’s Weekly, and two dimensional ephemera such as programs and invitations for events. No matter your political affiliation, the Museum of the City of New York’s collection holds a wide array of objects documenting the vibrancy of this city’s political history. Wish I could go there to see, but thank you so much for providing a look at these historical objects. This entry was posted on January 23, 2013 by Lindsay Turley in Digital Project, Manuscripts and Ephemera and tagged Badges, Buttons, diversity, Elections, Ephemera, Governors, Immigration, Mayors, Politicians, Politics, Tammany Hall, women.